Sandusky, Ohio - An attraction in an amusement park that works like a seesaw, lifting the visitors to 125 feet high, was closed indefinitely after a cable broke. Two people were injured in the incident. Cedar Point spokesman Bryan Edwards said a cable was disconnected the machine Skyhawk at about 10:00 pm Saturday. One of the injured went to hospital for an evaluation while the other was treated at the scene. 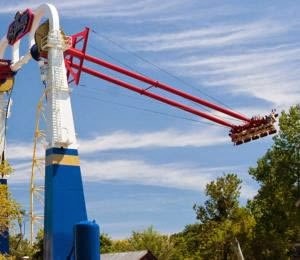 Skyhawk has two giant swinging arms to the public at 60 miles per hour. Edwards said Skyhawk will remain closed until the cause of the accident investigation. Cedar Point in Sandusky is the main park of Cedar Fair Entertainment Company.leave a comment hsm loves it.